As a foodie, I have to confess that once our Canadian Thanksgiving is over, I'm tired of pumpkin pie and all the traditional fare. Oh but I just love it when my American friends invite me to celebrate their Thanksgiving as well. And in all the years that I've made desserts, no one has ever told me that they don't like blueberries. They seem to have universal appeal. I like them because their skins are smooth and are less like to harbour tiny insects or dirt. Blueberries are the perfect size for young children and they are available year-round (thanks to modern freezing methods). One preference I do have though: I like blueberries warm and oozing their juices out onto something cake-like that has a subtle vanilla flavour. Blueberries don't need extra help from chocolate, nuts, or fancy sauces. I've always found excellent recipes in Canadian Living magazine, so when I found a book full of slow cooker recipes by Elizabeth Baird and The Canadian Living Test Kitchen, I had to get it. Some of you might remember my mango sticky rice dessert recipe (made entirely in my rice cooker) or my blueberry flaugnarde. I like it whenever I can just "set it and forget it" - don't you? Gives me more time to be a social butterfly. During thanksgiving and other family gatherings, my oven and stove are constantly in use. So, having a dessert kept warm in a slow cooker or rice cooker is perfect. Plus, the smell of them cooking while guests are eating just seems to put everyone in a better mood. All I need to worry about is getting the coffee going or any other beverages they like. I need to prepare gluten-free food, but you can certainly use regular, gluten-containing ingredients (in the same quantities) and your blueberry pudding cake will be just as fabulous. Just omit the xanthan gum. Oh and beware that some (not all) cornstarch might contain gluten, so for those who on gluten-free diets, check the label first. I always use salted butter, but many chefs prefer unsalted. If that is the case, just add an extra pinch of salt to this recipe. And lastly, instead of regular milk, I prefer unsweetened evaporated milk. It's thicker and creamier tasting and tends to be available in large quantities (at good prices) this time of year. NOTE: You will need a slow cooker that allows you to remove the liner and the lid entirely, since your blueberry pudding cake needs to cool for a full hour, uncovered, before it is ready to be served. Credit: (matt) on flickr / Licensed under Creative Commons Attribution-NoDerivs 2.0 GenericMy recipe is based on one called Blueberry Pudding Cake from page 256 of The Slow Cooker Collection by Elizabeth Baird and The Canadian Living Test Kitchen. I highly recommend using frozen wild blueberries if you can find them. Wild blueberries contain higher levels of the flavonoid anthocyanin and provide you with extra antioxidant protection. Note: I've only found 10 oz. or 12 oz. packages of wild blueberries and they yielded about 1.5 cups worth. Since you need 4 cups of blueberries for this recipe, you'll need to buy 3 packages of them, unless you can find larger quantities. Wyman's of Maine sells 15 oz., 3 lb, and 4 lb bags. But do measure them out, because blueberries can be different sizes or have lots of frost on them. *Dried lemon zest is 3 times as strong as freshly grated lemon rind. So if that is all you have on hand, you'll only need 1/3 tsp.of dried lemon zest. (Too much lemon zest can ruin your recipe). In a colander, under cold running water, rinse frozen wild blueberries. Discard any crushed or so-so looking ones and set aside on a plate to drain. Make sure you have 4 cups worth. In a small-medium saucepan over high heat, add 3/4 cup water, lemon juice, and 1/4 cup sugar. Bring to boil while you stir to dissolve the sugar. Turn off heat and set aside. Pull out your slow cooker and butter the bottom and sides of the liner. Add blueberries, 1/2 cup sugar, and cornstarch. Mix carefully to combine (but not crush the blueberries, if possible). In a medium bowl, whisk together: gluten-free flour and xanthan gum (omit xanthan gum if using regular flour), baking powder, and salt. In a large bowl, beat butter with sugar until light and add eggs one at a time. Beating well after each addition. Lastly, beat in lemon rind and vanilla extract. Portion out your 1/2 cup evaporated milk and keep nearby. Add the dry ingredients (from medium bowl) to the wet ingredients (in large bowl) alternately with the milk, mixing well after each addition. Scrape over blueberry mixture in your slow cooker - as evenly as possible - and smooth the top with the back of a wooden spoon or spatula. Add saucepan mixture (of water, lemon juice, and sugar) and carefully pour over batter in slow cooker. DO NOT STIR. Just cover and cook on high for 3 hours (or until skewer inserted in the center comes out clean). IMPORTANT: Remove liner from slow cooker and allow your gluten-free blueberry pudding cake to cool UNCOVERED for 1 hour before serving. Optional garnish: Serve with a dollop of whipped cream and/or a sprig of mint. 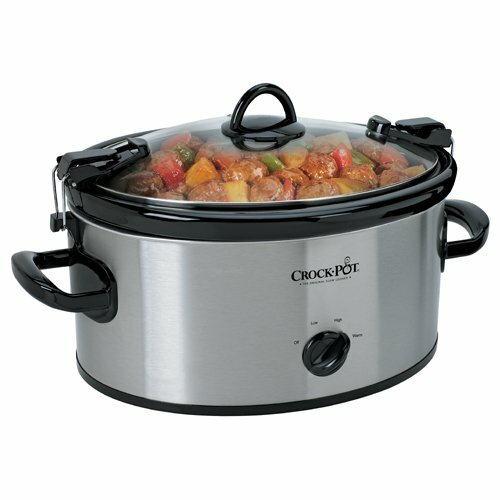 This is the type of slow cooker you will need for any type of pudding cake. The stone liner is completely removable and a breeze to clean. The locking lid is excellent for those who travel or for pot luck dinners. For once, someone has made a slow cooker with decent-sized, rugged handles. Also comes in a shiny festive red colour and Amazon provides a video demonstration.